Take a close look at this piece of hardware, because you’re going to be seeing a lot of them around: the X-Session Pro is cheap, simple, functional controller hardware with a DJ-style layout. There’s nothing fancy here, but you get all the basics: crossfader, four sets of EQ knobs, four vertical faders (for emulating 4-channel DJ mixers), a crossfader, and two sets of transport controls. 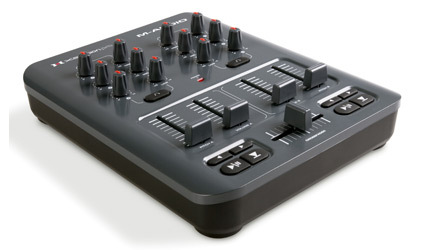 I’m not going to throw out my Faderfox DJ2, which is a Porsche to M-Audio’s Ford Taurus as far as controllers (heck, it’s even German), but as a budget buy, the X-Session Pro is likely to become an instant blockbuster. The controller appears to have the new, improved build quality and feel of recent M-Audio controllers, and the price is dirt cheap: US$129. Compatibility is a no-brainer, too, as the device is fully class-compliant USB (no drivers needed on Windows, Mac, or Linux). First, although this is to be expected, M-Audio describes this exclusively as a “DJ device.” Sure, DJs will love this, but M-Audio has long been a distributor for VJ software (ArKaos) and laptop performance software that goes beyond DJing (Ableton Live). I don’t expect it to happen any time soon, but some day music product makers will realize there’s a convergence going on between computer music, DJing, and live visuals, blurring the lines between these different markets. Second, M-Audio touts the fact that the X-Session Pro supports “MIDI learn.” Woo-hoo! The X-Session Pro brings DJ mixer-style tactile control to any software that supports MIDI Learn. … For example, you can easily assign the crossfader on the X-Session Pro to the crossfader within Ableton Live and add a new dynamic to your live performances or studio work. With a digital DJ application like Traktor, you can assign the various level, EQ and crossfader controls to the X-Session Pro. The possibilities are virtually endless. Wow, the possibilities are virtually endless — just as they are with any MIDI controller. What M-Audio actually appears to be saying is that they didn’t bother to create any MIDI templates, so you can manually create your own by using the MIDI learn function in your software. I’m guessing that’s either a) laziness, b) not wanting to include a disc in the package (though they could have put them online), c) wanting to make plug-and-play compatibility happen only with M-Audio’s own DJ software, Torq, or d) a combination of all of the above. But no matter: the layout looks great, the price is fantastic, class-compliance is a huge bonus, and I’m sure smart readers here will happily create their own template. I might even pick one up as an extra VJ controller. In other news: for those of you who liked the X-Session, better try to find one now, as it seems M-Audio has discontinued the original. 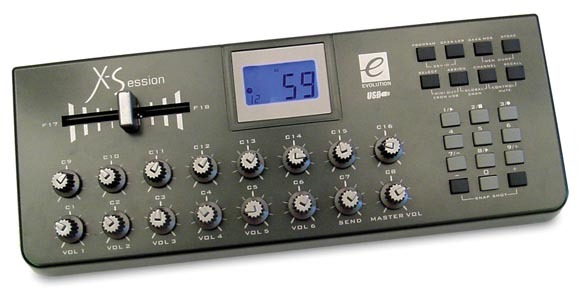 Before the X-Session Pro, M-Audio shipped Evolution’s X-Session, now evidently discontinued. It could still be a good buy if you want a compact crossfader controller, and you could probably find it dirt-cheap.